The Aurora AS1023CD shredder is capable of shredding a variety of materials including paper, small paperclips and staples, credit cards and CDs (via a separate CD shredding slot). It can handle up to 12 sheets of 75gsm paper at a time, shredding them into 5 x 55mm pieces with a P-3 security rating. 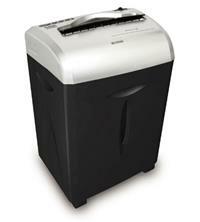 Suitable for home or small office use, the Aurora AS1023CD also comes with a range of useful features including: reverse function to help clear paper jams; a patented ShredSafe cover which can cut the power to the shredder if fingers or objects are pushed into the entry slot; a pull out waste bin; and castors to make moving the shredder much easier. So, if you are looking for a shredder that cuts a variety of materials, with safety features and a decent size bin capacity, this could be the model for you.